By crikey do I have a bit of a treat for you today…and me as it happens! 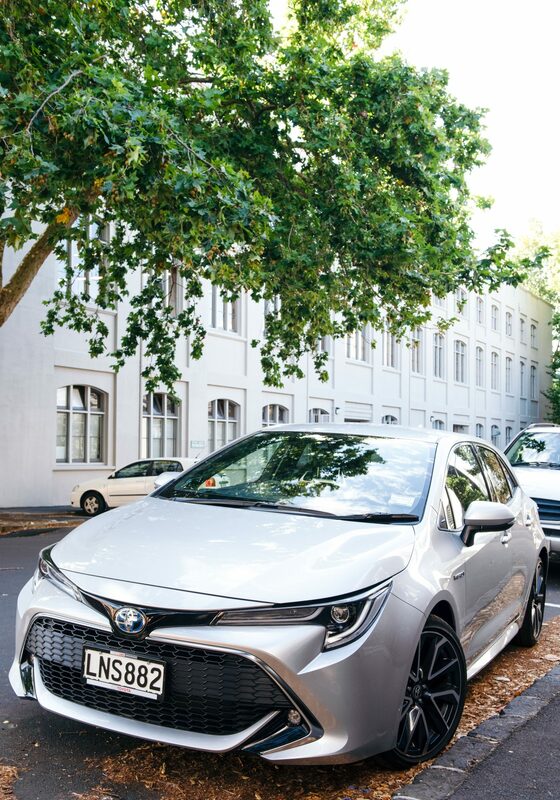 Last week I was lucky enough to team up with the good people at Toyota New Zealand and have in my possession their all-new, super-stylish, hybrid-electric Toyota Corolla for a full week. 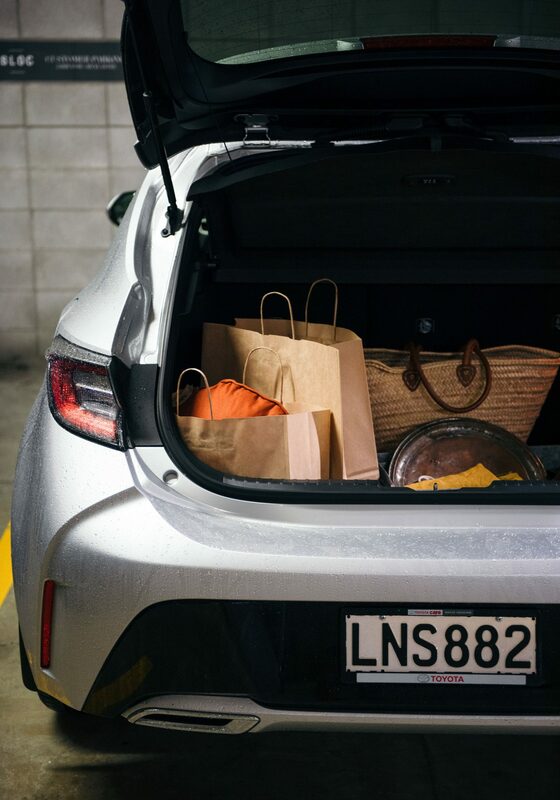 Cue much racing around doing my normal workaday stuff, revelling in the added space (deceptive for a compact car), mod cons (hello GPS without my phone), and most excellent fuel economy thanks to the petrol/electric motor combo. 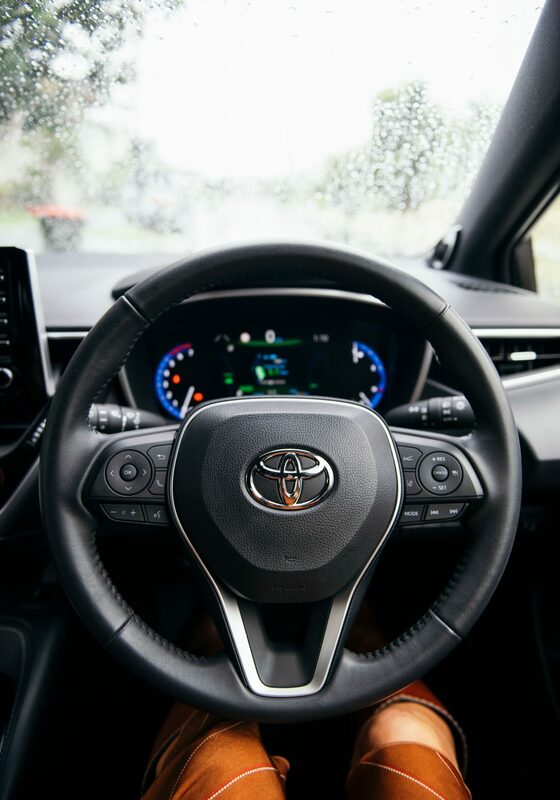 For me it made perfect sense to team the European styling of the Toyota Corolla with my own European hybrid creation – a bloody fabulous, super easy and economical pasta dish that packs a flavour punch. 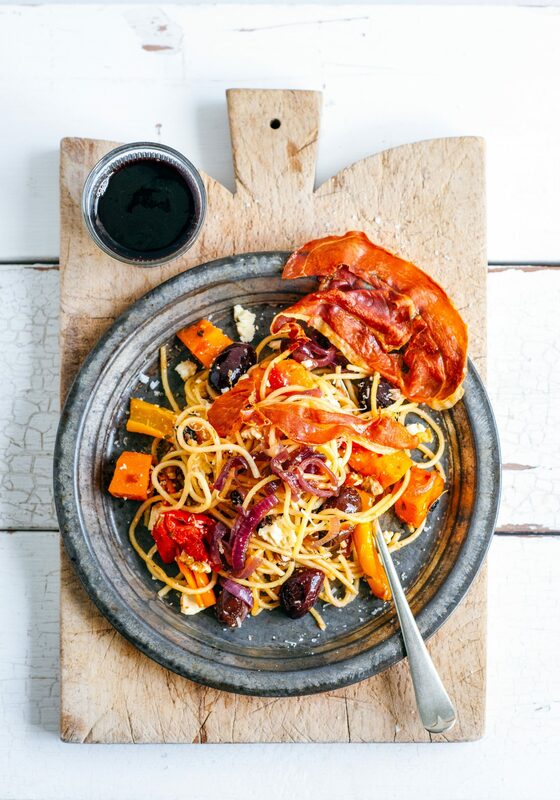 You can choose whatever pasta you fancy, although I think spaghetti or penne work best, to match with the sweet roasty kumara, tomatoes, peppers, currants and caramelised onion, salty feta and prosciutto and a crumbling of walnuts. The dish is incredibly simple to throw together – the magic is in the ingredients that work so beautifully marrying textures and flavours in a dish that is perfect to share with your dearest mates over a glass or two of good red. Now that there is finally the whisper of an autumnal nip in the air, it is the ideal, timely, easy entertaining dish! Aaaand in other news, there is so much happening I barely know where to begin. My house is on the market and up for auction at the end of next week, so having cleaned it assiduously (for days) for the first open home, I have since been tiptoeing around not wanting to mess anything up…also there are many, many flowers. 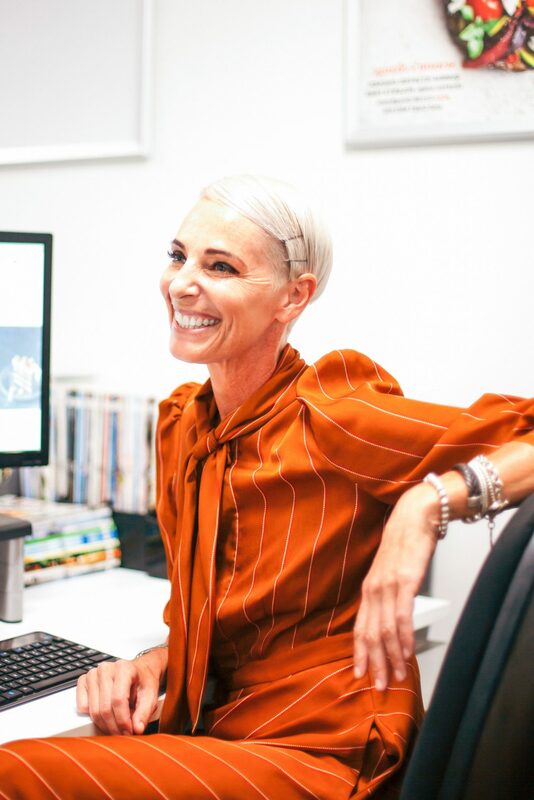 Meanwhile I have a contract under way on another place which I absolutely love – hurrah – so exciting, keep your fingers crossed for me that it all comes together. (This time next week I should know, gah, I’ll be hanging out.) Given how busy I have been with the house/s and a lot of normal work on, I also decided there was no better time than now to restart drum lessons. (I say restart, last time I learned I was 16 years old, so waaaaay back in the mists of time), and it has been bloody brilliant. I am totally inept but very enthusiastic…I love it! (I feel that perhaps I swear substantially more than my teacher’s young students, but perhaps that will abate as my skills improve). I’m off to pick up my drum kit today so I can start practicing properly/regularly – critically, at a time when none of the neighbours will be at home. Right then, must get up and cracking – I hope you give this super easy, flavour packed pasta a whirl, it is absolutely delicious! Preheat the oven to 200˚C and line an oven dish with baking paper and lay the prosciutto out on an oven tray for grilling. Put the kumara or pumpkin, peppers, rosemary, garlic, salt, pepper, tomatoes, currants and olives into the prepared dish and toss to combine. Roast for 20 minutes (or until cooked through), tossing once during cooking. While the vegetables are roasting bring a large pot of water to boil and cook the pasta according to packet instructions (I usually cook the pasta for 1 minute under as it will keep cooking a little longer. Drain the pasta well. As soon as the vegetables are cooked through, turn the oven to grill and pop the prosciutto in until just crispy and golden. Meanwhile add the caramelised onion, pasta and 2 tablespoons of cooking water to the vegetables and toss to combine. Layer onto into serving plates and garnish with crumbled feta and walnuts with a shard or two of crispy prosciutto on the side. Complete the dish with a simple green salad and a glass or two of red and you’re good to go!